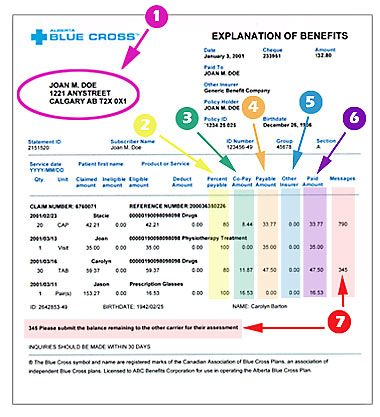 Where can you go to get more help with understanding your Alberta Blue Cross claim statements? This page contains general information, but if you still have questions, please contact our Customer Services department. Since the issues relating to adjudication are complex, we issue a detailed claim statement for each completed claim. Plan member's name as it appears on their ID card and their address according to our files. Percent Payable: The percent amount Alberta Blue Cros pays for the product or service (e.g. 80 per cent or 100 per cent). Co-pay Amount: The amount of eligible expense for which the member is responsible. Payable Amount: The dollar amount that Alberta Blue Cross will pay for this product or service. Other Insurer: The amount that other benefit carriers (including other Alberta Blue Cross plans) paid toward your benefit claim. This information is only displayed if it was available to us when we assessed your claim. Paid Amount: The total of this column is the amount of your cheque from Alberta Blue Cross. 61: The amount of time allotted by this plan for submitting claims has been exceeded. Clarification: Your plan requires that you send in your paid receipts to Alberta Blue Cross within a specified period of time. If your receipts are not received within this time limit, you will not be eligible to claim for the products or services. 307: Payment has been reduced as the maximum amount payable for the benefit or benefit period has been reached. Any remaining portion is not eligible for reimbursement on this plan. You submitted a $250 eyeglasses claim but your benefit maximum is $150 every 24 months. The portion of the payment you are responsible for is $100, and you will not be eligible for this benefit again for 24 months. You submitted a claim for $35 for a service, but your benefit plan's maximum allowable amount is $25 per visit. You would be reimbursed for $25 of the $35 claim. 378: The maximum amount for this benefit has been paid. The remaining portion is not eligible for reimbursement. Clarification: The dollar maximum allowed for this service has been reached. For example, you submitted a $40 claim for massage therapy, but your plan maximum is $23. Your portion of the payment will be $17. 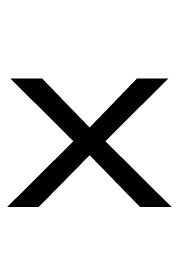 448: In order to assess this claim, we require an original maximum reached letter from the provincial plan. Clarification: We require a letter from your provincial health plan indicating that the maximum dollar amount has been reached. This must be submitted to our offices, along with other supporting documents, in order for your claim to be assessed. 790: The claimed amount has been reduced to the maximum amount allowed by your plan for this product. The remaining portion is not eligible for reimbursement. Clarification: The plan that you are on with your employer has a maximum fee allowable for this product or service. The claim is reduced to that fee amount. 1639: This patient is not eligible for this benefit. Clarification: The product or service is not covered by your benefits plan.